This is a great adventure game in which you will witness the very creation of Frankenstein. He has just been brought to life by the doctor but he is desperate to escape from this facility because who knows what they might try to do with him now. Living his life in a dark basement isnt enough for him as he wants to experience all the things the world has to offer. Interact with as many objects and items you can find in order to get to something that might seem like a way out of there. Make sure not to get spotted by the doctor or he will try to tie you up again. 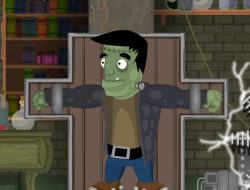 Use the mouse to help Frankenstein escape. Frankentory 10.00 between 0 and 10 based on 1 votes.